Text messaging technology provides a simple, yet efficient platform to improve direct marketing and customer relationship management. It is short, to the point and immediate. Text messaging does however, enter the customer’s personal space, so be very selective when you plan to use bulk text messaging for your marketing campaigns. This month, eMarketing Insight explains how best to use this cost-effective mobile marketing technology. Get an updated email address from your customers. Trigger a text message when an email has bounced three times as part of a continuous data cleansing exercise. Use text messaging to gather email addresses before you embark on an email marketing campaign or before sending eBills to your customer base. Mobile phones rarely leave our sides these days, making mobile technology an ideal partner for marketing campaigns. What are the DOs and DON’Ts of text messaging? Ensure there is a reply path, so that the recipient can easily unsubscribe at the least cost. Personalize the message with the recipient’s name. Start the message with the sender’s brand name, so that it is identified up front. Regularly check replies and honor requests to unsubscribe. Clearly communicate how to unsubscribe. Use “STOP” as a general default unsubscribe keyword. Report any unsolicited commercial messages. Use sender ID, because if the recipient responds, the reply will be lost in cyberspace. Send messages from a premium rated SMS / Text messaging short code, as this prompts reply without revealing the cost. Use capital letters, unless it is to highlight something critical or your “call-to-action”. If your brand name is in capitals, then obviously this rule doesn’t apply here either. 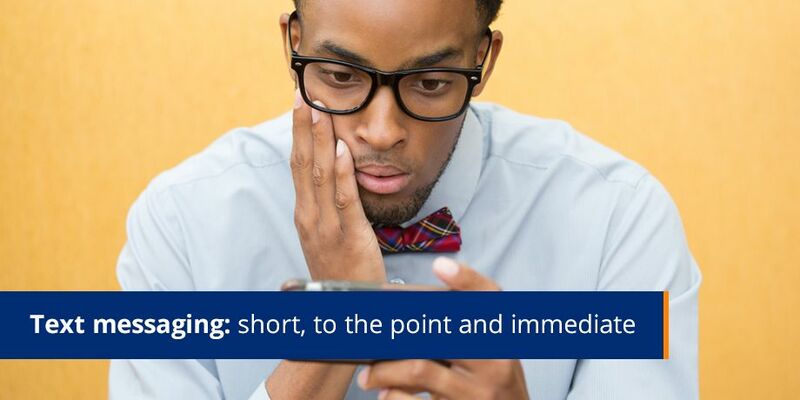 Use text slang such as phonetical abbreviations – your target market may not appreciate it.